A re-introduction to our range and an extremely popular newcomer owing to it's 6-8 week cropping period. 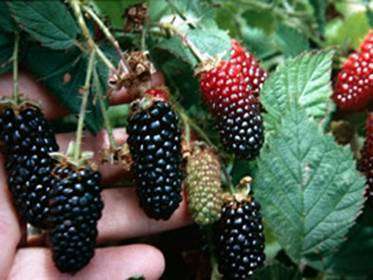 Karaka Black produces long, cylindrical, shiny dark black fruits which have a wonderful aromatic true blackberry flavour. Very heavy yielding, out cropping Sylvan and Waldo in trials. Bred in New Zealand, the plant habit is only moderately vigorous and, although spiny, is less so than most thorny cultivars. A spacing of 5-6' between plants is ample. Can be grown as a trailing plant or traditionally, along posts and wires. Reliable, very productive, packed with flavour and with an extraprdinarily long picking period, Karaka Black is a top rate new variety.